Back in 2010, I made a new knitter friend named Bonny and she gave me The Knit Kit which I adore. Especially as a new knitter, it was wonderful to have all the tools in a portable and hard-sided case. Since then, I’ve learned that it is perfect for traveling and being at home. I’ve also learned that when I’m at home or just popping out to the cafe for knitting with friends, I sometimes prefer a more project specific and homemade knit kit. One that fits more stitch markers or special tools essential for the project at-hand. So, in today’s post I am sharing the details on what’s in my big homemade knit kit. Needle Gauges are so useful. 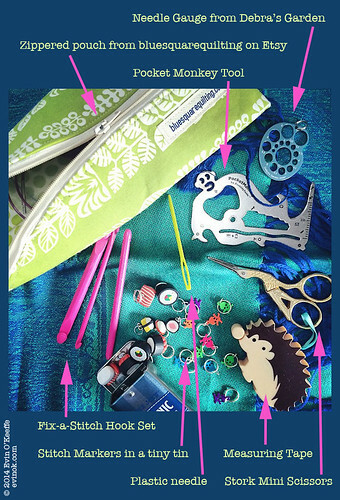 In my kit is Debra’s Garden Metal Needle Gauge though this KnitPro Needle Gauge or Susan Bates Knit-Chek Needle Gauge are similarly compact and more budget-minded so you have options. Zippered Pouch can be from anywhere. Mine is fabulous and from an Irish Etsy shop called Blue Square Quilting. It was in my Knitmas 2014 gift box. But you can use anything, even these (Amazon.com). Fix-a-Stitch Crochet Hook Set was a gift from Bonny. She always knows the coolest things! They’re available on Amazon.com and Amazon.co.uk . Measuring Tape. I got mine at Tiger. Plastic Needle for weaving in the ends. Like this set of two . Scissors for trimming when done or switching colors. 3 1/2-Inch Gold Stork Scissors though I bought my pair at Tiger so if you’re in Ireland you can look for them there or order them from Amazon.co.uk . When I’m making a tea cosy or sweater, there are stitch holders in the bag too. It all depends on what tools I need. The folded pattern is tucked in there too. When traveling, I stick with simpler projects so the original Knit Kit is perfect still for that. Especially since the scissors in that are TSA friendly. What’s in your knit kit? This entry was posted in Knitting | Crochet, Knitting Gifts & Supplies, Tutorials | Patterns and tagged knit kit, knitmas, Marseille, stitch markers. Oh I’m so jealous of your knit kit! Everything is very cute and I covet those sushi markers. I have all the same things in mine but most of the notions were freebies from when I bought knitting magazines (including a hideous green plastic case). Think it’s time I upgraded! The nice thing with upgrading a knit kit, Mel, is that it can be done bit-by-bit as you find the perfect pieces. And that also makes it a more budget-friendly splurge since it is $5/month if you add a new piece every few weeks. Most of the items in my kit cost less than $3 or were gifts. The sushi stitch markers were ones I made. Should have made more to sell, I suppose. Can’t wait to hear how your upgraded knit kit is! I LOVE those sushi markers! I also always have a pen and tiny post-its in my kit so I can mark a pattern or write down any thoughts that come up while I’m knitting. Ok, convinced I should make more of those sushi stitch markers to sell. Now, I must remember where I bought the charms in the first place.